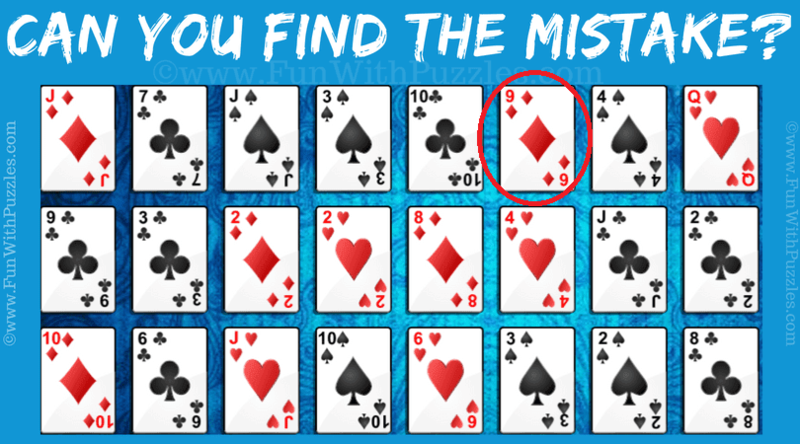 Here is Picture Gallery Solitaire Game Mistake Puzzle for Adults. Again in this mistake puzzle, you need to have keen observation skills to solve it. Moreover if you have ever played any Card Game, then it will be helpful to solve this Mistake Puzzle. In this given Picture Riddle, you have to find the mistake. Lets see if you can find the mistake in this picture? Can you find the Mistake in this Puzzle Picture? Answer of this "Picture Gallery Solitaire Game Mistake Puzzle", can be viewed by clicking on button. Please do give your best try before looking at the answer.